No matter your personality, whether you’re a meticulous organizer, fly-by-the-pants creative, or somewhere in between, chances are that at some point in your life, you’ve probably had trouble with procrastination. While individuals with social anxiety may be more prone to procrastination, nearly everyone puts off until tomorrow something they know they should do today. It’s almost a universal experience. However, there are a few things you can do to keep yourself on track and maintain focus on your projects. Procrastination can be described as any behavior, activity, or task that you do instead of working on the thing you’re supposed to be working on. You know, the thing that’s due in two days? It’s normal to want to put off tasks that are difficult or just plain unpleasant, especially when there’s a much more interesting alternative right in front of you. It’s a basic problem of willpower and delayed gratification: sometimes, even when you know that you should be working on that big presentation that you’re giving to your company’s shareholders tomorrow, you just can’t drag yourself off the sofa. Some people, especially those with social anxiety, are also afraid of failure too, so it makes sense that another cause of procrastination is rooted in fear and insecurity: it’s tough to talk yourself into writing that paper or building that shed when you’re convinced that the end result isn’t going to be any good, anyway. The great thing is that all of this can be solved with one organizational technique: lists. If you’re serious about overcoming your procrastination, it helps a lot to have a system that you can break out for the things that are difficult for you to plan, or that you easily lose sight of, like your daily schedule or your goals for a long-term project. 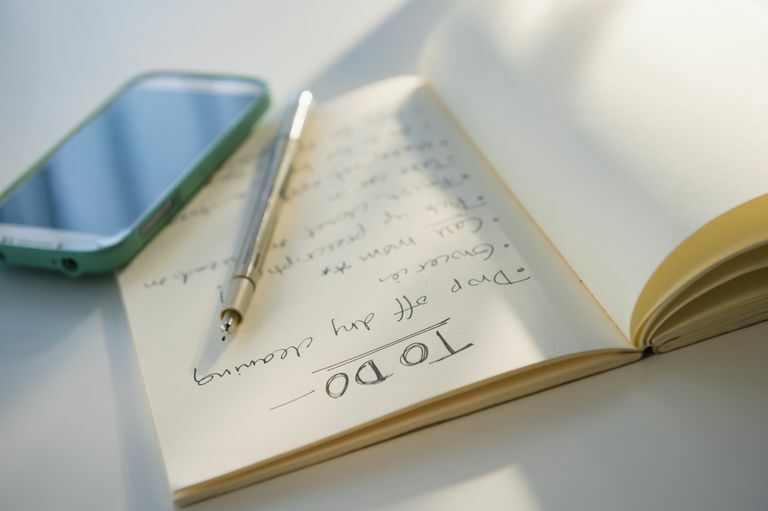 Lists are the perfect system for organizing your life. They’re cheap and available anywhere – all you need is a piece of paper and something to write with - and you can customize them however you like. For example, do you notice that your day is hectic and you feel like you’re constantly running around even though you never seem to get anything done? You might have better luck if you try to write a list of all your activities for the next day, and then block them out in a planner-type grid, organized by the time and type (family, work, fun, etc.). You could even color the boxes differently depending on how long each block of time is. Putting schedules and other appropriate information into a graphic can be very useful, and that’s not just because writing something gets it out of your head forces you to think about it; once you learn your new system by heart, you’ll be able to truly check your planner “at a glance,” saving countless hours a year. Also, seeing your obligations, goals, and chores written on a page can make them seem more real; you might feel guiltier if you flake on something you had “blocked in” well ahead of time. If your procrastination is based less in disorganization and more in anxiety and insecurity, don’t worry. Lists can work for you, too. Try psyching yourself up for a blind date by making a list of things you and your date can talk about. Or if you’re feeling down on yourself, write a list of all your good qualities. Even if they seem silly, put all of them in. For example, “I have great taste in socks” or "I'm pretty decent at wiffle ball." You’ll find that there’s actually a lot to like about you – you just needed a tool to focus on it, and that tool is the list. Lists can be made of everything, and they don’t just have to be a bunch of words next to numbers. Try thinking of the different types of lists you could make to help yourself get organized, and don’t procrastinate: don’t do it tomorrow, do it today!